One of the nation’s leading alcohol industry associations held a briefing on Capitol Hill on Friday to tell lawmakers and congressional staffers about its position on marijuana legalization. The Wine & Spirits Wholesalers of America (WSWA) became the first major alcohol association to call for the end of federal cannabis prohibition in July. At last week’s briefing, the group reaffirmed that stance, emphasizing that the federal government should allow states to legalize marijuana without interference. A representative from the group also suggested that the cannabis market could take lessons from the current regulatory approach to alcohol, including when it comes to distribution and quality control testing, one person who attended the event told Marijuana Moment. There was also a conversation about developing technologies to detect active impairment from marijuana on the roads. WSWA then outlines a series of recommendations—from implementing impaired driving standards to testing product formulas. For the most part, the recommendations align with existing regulatory models in legal states. 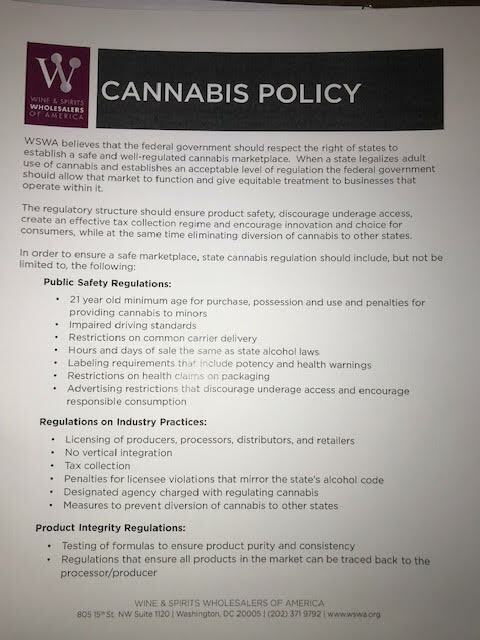 Where the alcohol and marijuana industries might have disagreements, though, is with WSWA’s opposition to vertical integration, under which one company manages more than one area of production and distribution that could otherwise be delegated to other businesses. The alcohol industry generally operates under a three-tier system in the U.S., through which separate operators handle production, wholesaling and retail sales. Some have suggested that the alcohol industry wants the cannabis market to adopt its approach so that existing businesses like beer, wind and liquor distributors can profit from legal marijuana as well. But Dawson Hobbs, WSWA senior vice president of government relations, denied as much when the association made its initial announcement earlier this year. “No, what we’re talking about is just creating a pathway for states to have federal recognition of legalization by enacting appropriate regulation that creates a safe and reliable marketplace,” Hobbs said at the time. The post Major Alcohol Association Briefs Congress On Marijuana Legalization appeared first on Marijuana Moment. Major Alcohol Association Briefs Congress On Marijuana Legalization was posted on Marijuana Moment.